ORIGINAL VINTAGE TOWER COUNTER BALANCE IMPERIAL KITCHEN SCALES ON WOODEN BASE. A small set of five solid brass bell shaped weights. 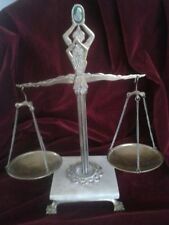 Vintage Librasco Scales & Weights. Condition is Used. Dispatched with Royal Mail 2nd Class. Weighing pretty heavy weights, up to 26Lbs, being 11.7kg. The balance beam feels wonderfully sensitive, and is a nice nostalgic piece. 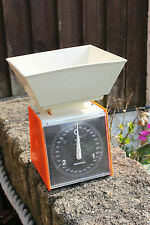 Cream Metal Vintage Dulton Kitchen Scales with timer. Excellent used condition. Please feel free to ask any questions. 4 X Brass Kitchen Scale Weights - Crown Stamped. Condition is Used. 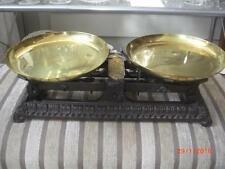 Weights made from brass for kitchen scales. 8oz, 4oz, 2oz, 1oz. Retro Vintage Tower Kitchen Scales Lbs Oz. Condition is Used. Collection in person only. Lovely condition, belongs to my father. SET OF 9 CAST IRON WEIGHTS FOR KITCHEN SCALES. METRIC. 9 CAST IRON KITCHEN SCALE WEIGHTS. 1KG, 500G, 200G X2, 100G, 50G, 20G, 10G & 5G. 2 brass/copper weights - 2 oz and 1 oz. Underneath is stamped 7 & 14. The Viking only has the weighing bowl. There are eight brass weights. The cast iron does have scratches especially The Viking. In overall good condition there is a missing plate from The Viking. Scales are as follows. RJ thornton and co the Viking red. Adjusting Pin Needs To Be Removed From The Back To Work. In Excellent Working Condition (Looks To Be Unused). The pan is 22.5 cm long and 17.5 cm across. It is in a nice unpolished condition as shown. Vintage HuntCo Borose kitchen scales with box of iron weights in various weights. In great working condition, but does not a clean as its quite dusty/dirty as you would expect for the age. Measures 12.5"w. x 8.5" h. (approx) Please see photos for further. SET OF 4 IMPERIAL WEIGHTS. Oertling vintage weighing scales and weights. The photos show the condition of the scales and accessories. I suppose the stack would possibly take a 4 dram weight, but I don’t have one. I can’t imagine that it was ever the intention by Avery to include the smallest 3 in a set, although they certainly finish off the stack, and the reason why I have included them. Here for sale are a bundle of weights that I have had since the 1970s. 7 Bell weights- 1 lb, 8 oz, 4 oz, 2 oz, 1 oz, 1/2 oz, 1/4 oz. 4 Flat weights- 2 oz, 1 oz, 1/2 oz, 1/4 oz. 5 Flat weights- 50g, 20g, 20g, 10g, 5g. Good condition, will make an ideal feature in your kitchen. An antique Edwardian brass weight in the ¼ oz size. It is in good condition, but will clean up a bit better. An antique brass weight in the ½ oz size. It is marked E6R for Birmingham. It is in good condition. COLLECTION IN PERSON IS AVAILABLE FOR ANY ITEM. Vintage 4 LB solid brass butchers bell weight, 6" tall and 3" wide at the base. As can be seen it is in very good condition. One is marked 1 oz TR (for 1 troy ounce), another is marked 1 oz TROY and the last one is marked 1 oz APOTH for Apothecary weight. They are in pretty good condition, but will clean up better. As can be seen they are in good condition. 5 HEXAGONAL METRIC WEIGHTS 500 G, 2 X 200G, 2 X 100G Kitchen Scales. 1x 500 G, 2x 200G, 2x 100G. Kitchen Scale Weights. This is a stunning set of bell weights the range is from 7 lb to quarter of an ounce they are in need of a good clean and shine but have an amazing presents just as they are. An antique Victorian brass weight in the small 8 drams size. It is marked VR 6 for Birmingham. As can be seen it is in good condition. Set of antique weights, brass and cast iron. An antique Victorian brass weight in the ½ oz size. It is marked with the YWR Yorkshire West Riding and partial Yorkshire rose marks, and is also marked VR 298 for Yorkshire West Riding. It is in good condition, but will clean up a bit better. They stack firming a triangle with the lightest weight at the top. Kitchen usages. We are reliant on openness & honesty. We hope we have given sufficient information so that a balance decision can be reached. VINTAGE RETRO KITCHEN SCALES BY SALTER. NO. 34 COLOUR IS GREEN. Made in England. No. 34 - 20lb By 1 oz. VINTAGE USED CONDITION- PLEASE SEE ALL PHOTOS. I AM UNSURE IF THE PAN IS THE ORIGINAL ONE, HOWEVER IT STILL LOOKS GREAT. MEASURES 20 CM AT BASE, 27 CM IN HEIGHT (EXCLUDING PAN). 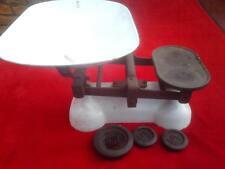 VINTAGE SHOP WEIGHING SCALES (BLACKPOOL)WITH A SET OF 5 WEIGHTS. Film prop. 4lb, 2lb, 1lb, 8oz,4oz, see photos. A mixed set of plain brass weights in the larger range of ¼ oz to 2 lb sizes. They have been selected by size rather than stacking ability, but stack pretty well. They are in good condition, but do carry marks from wear, tear and use, and will certainly clean up a bit better. Retro Vintage shop Scales Lbs Oz. Condition is Used. Dry stored. Local pick up as heavy. Although a very practical item for when you need to weigh something, collectable kitchen scales have an iconic look which makes them a stand out item for ornamental use around the home. Genuine vintage collectable kitchen scales are available from many different eras with shape and materials varying with age. Iron kitchen scales are an old classic design style. There are many examples from the Twentieth Century which also saw the arrival of plastic kitchen scales and even wicker. The wide selection of styles and materials makes it easy to find collectable kitchen scales to suit your style. If you want the classic look, but without the antique price tag there are many modern reproductions of classic designs available using materials such as brass for collectable kitchen scales. As well as being an eye-catching accessory in the kitchen or around the home, collectable kitchen scales are also highly practical for weighing out ingredients or even parcels. Collectable kitchen scales are highly durable. Their simple mechanics ensure that there is very little that will go wrong with them allowing vintage scales to still provide accurate weighing no matter their age. The aesthetic appeal of older scales is something that just can't be replicated. Many collectors use collectable scales as ornaments, rather than for their original purpose. 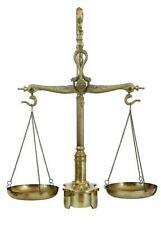 Collectable scales come in a range of sizes from large shop style scales to miniature scales. This allows you to find a set of collectable kitchen scales which is perfectly suited for the space you have available. 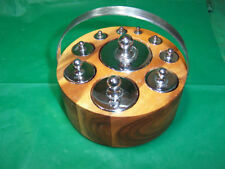 Collectable kitchen scales come with a selection of different sized weights. These are used for taking different measurements, but a nice array of weights can help complete the look of kitchen scales when on display. Collectable kitchen scales come in a wide variety of styles at a range of price points which allow you to enjoy the look of collectable kitchen scales no matter what your budget.